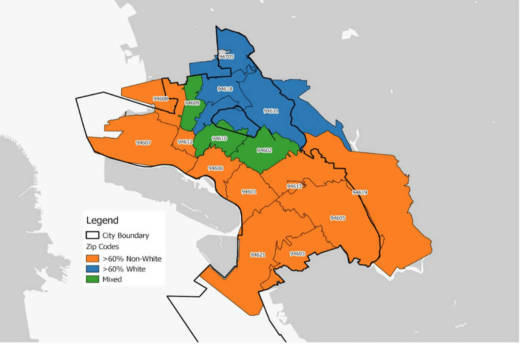 Oakland's newly released Equity Indicators Report is the first time the city has dug deep into the massive gulf that separates white from nonwhite residents around access to basic resources, like housing, education and health care. The 160-page study, developed in collaboration with City University of New York's (CUNY) Institute for State and Local Governance, used existing data sets to examine the disparities between people of color and white people across six themes associated with standard of living: economy, education, public health, housing, public safety, and neighborhood and civic life. Oakland scored relatively high in matters of civic engagement. But scores for public safety were dismally low. Overall, the city came out with a score of 33.5 out of a possible 100. "I was not surprised we scored low," said Darlene Flynn, director of Oakland's Department of Race and Equity. "Because I do equity work, and I know how great the disparities are." She said the report is important for a variety of reasons, including setting a baseline for improvement over time. "It also increases awareness and consciousness around the conditions in our city that are not fair and inclusive," Flynn said. "And it gives us a way of prioritizing where we might focus our attention and our energy to make the greatest difference in people's lives in our community." Flynn said one immediate next step in the long process of reducing the gap between the haves and the have-nots is to engage Oakland's residents. Mayor Libby Schaaf is presiding over the first of a series of community meetings to discuss the report's findings in East Oakland on Friday. Additionally, the city plans to reach out to 500 families across Oakland's most equity-challenged neighborhoods to solicit feedback and ideas for potential solutions. "These are the families that are actually experiencing these inequities, so they have really robust and important recommendations on how to improve their experience," said Francis Calpotura, who is leading this grass-roots effort. Calpotura is the founder and director of In-A(d)vance, an Oakland-based social equity nonprofit, and the head of a coalition of community organizations working with the city on developing the Equity Indicator Report. Calpotura said his team aims to conduct interviews with families between now and November, and then will present the findings to city leaders in December. Oakland is one of five U.S. cities collaborating with CUNY and the Rockefeller Foundation on this Equity Indicators research. The others are Dallas, Pittsburgh, St. Louis and Tulsa. Each city is taking a slightly different approach in terms of the data sets it uses to measure disparity and how it goes about collecting and working with the findings. Calpotura said one thing that sets Oakland's study apart from the those of other participating cities is the level of community engagement. "I think we're the only ones out of the five for which a robust engagement and participation of communities and organizations in those communities is centrally important," Calpotura said. The report comes at a time when global research trends are showing that racial inequities could destabilize cities. A World Economic Forum report explored income gap issues, while a study from the National League of Cities demonstrated disparities in racial equality alongside widening income gaps. Calpotura said progress toward narrowing the inequity gap is going to be a long haul, and that community members and city leaders have to work together to bring about change. Calpotura said some Oakland politicians have been slow to recognize the city's role in creating and promulgating disparities over many decades. "Acknowledging that, in fact, the city of Oakland has a role to play in fostering inequity is not a universally held belief," Calpotura said. He said he hopes the new report will help to change the minds of the naysayers. "At least it opens up that conversation," he said. "And it also smokes folks out who are resistant to this kind of effort."